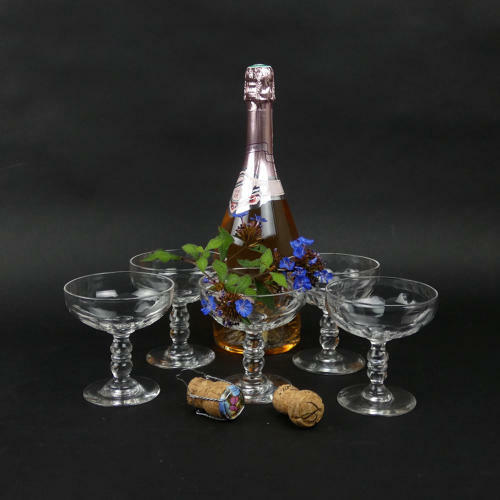 A set of 5 French crystal champagne coupes. These are made from a good, heavy quality crystal and they date from c.1880. There are very marginal differences in the dimensions of the glasses in this set as they are all hand blown. They have a simple cut design to the underside of the bowls, which are quite wide. The stems are triple knopped and this design can also be found in champagne flutes and wine glasses, so they would be quite easy to match up. This shape of glass is currently very popular for serving cocktails, as well as champagne. They are all in excellent condition and the design is very attractive.